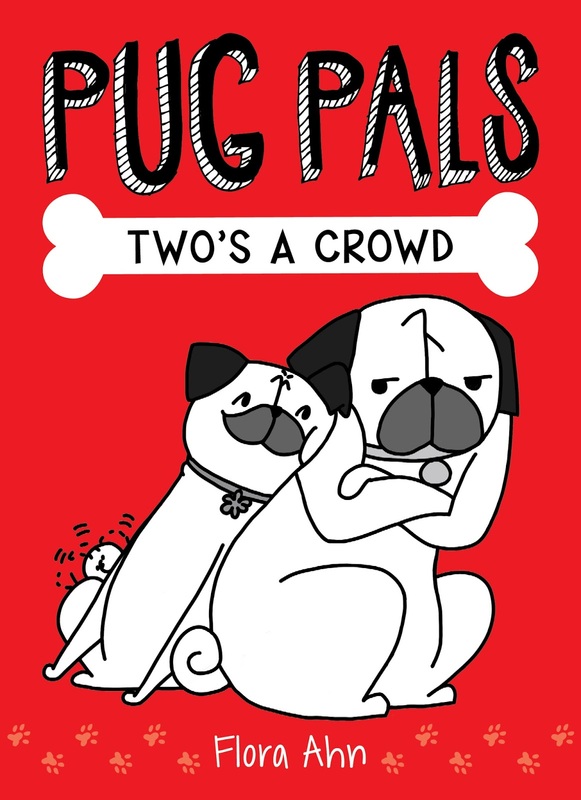 Bah Humpug: PUG PALS: TWO'S A CROWD COVER REVEAL!!! I'm so excited to share the cover for my first book, PUG PALS: TWO'S A CROWD, that will be published by Scholastic in Spring 2018. As you may recall, almost a year ago I posted my book deal announcement here. The series has been renamed from Pugling Rivalry, but the story has remained the same. Part of why I haven't been posting as much on my blog is that I've been super busy putting together the story and illustrations for my book. There was a steep learning curve in this process. Illustrating for a chapter book is very different from illustrating for a blog or social media posts. And I also was learning how to use Photoshop and a Cintiq, as all of the final illustrations were done digitally. So you can imagine how rewarding it feels to finally see it all coming together at long last. And without further ado, the cover! For those of you who have followed me for a while, you'll know how true to life this cover is. Well, at least it was pre-Monkey (my new and third pug mix puppy–I'll post more on that soon). But when Rosy sets off on her own to find and rescue Mr. Bunny, Sunny starts to worry. Rosy's never been outside by herself before. Sunny will have to gather all the canine courage she has and go after them–before Rosy and Mr. Bunny are both lost fur-ever! And don't you worry. There's going to be plenty of familiar Bah Humpug goodies like drumstick attacks, pug yoga, and even ninja pugs. PUG PALS: TWO'S A CROWD goes on sale January 30, 2018. Mark your calendars! It will be followed by a second book in the series that will be published later in the year. 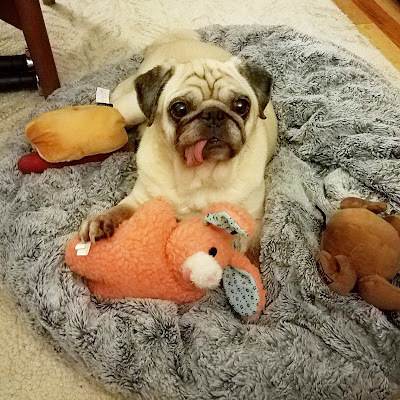 And as a thank you to my followers who have liked, commented, and supported me, Sunny, and Rosy (and now Monkey!–again, more on that later), I'd like to do a GIVEAWAY!!!! I'll be giving away five signed copies of galleys of the book. For those who don't know (as I didn't either up until this book-making process), galleys are bound editions of the book that are used to sell the book and publicize it before publication date. The galleys for my book contain mostly unfinished art, as I'm still in the process of finalizing a lot of it. I'm going to have to limit the giveaway to the United States as I'll be the one doing the mailings (sorry!). To enter, please post a comment below by 5pm ET on Friday, June 2, 2017, and I'll pick five commenters randomly (I'll either assign numbers to each comment and then use a random number selector or I'll put names in a hat and have Sunny and Rosy pick them). If you win, I'll contact you and ask that you privately email me your mailing address. Good luck! 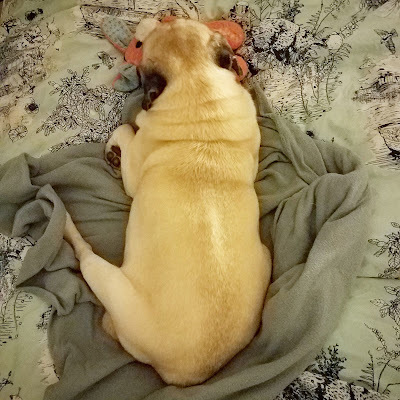 And, in case you were wondering, yes Sunny is still very much attached to her Mr. Bunny. This is a sixth or seventh generation Mr. Bunny, recently bought. And this is an older Mr. Bunny, who's seen better days. I'll even throw in a pug drumstick for your viewing pleasure. Wow! So thrilled about this — and of course, already looking forward to the sequel, starring the irrepressible Monkey! I love seeing your posts on Facebook and reading your blog. 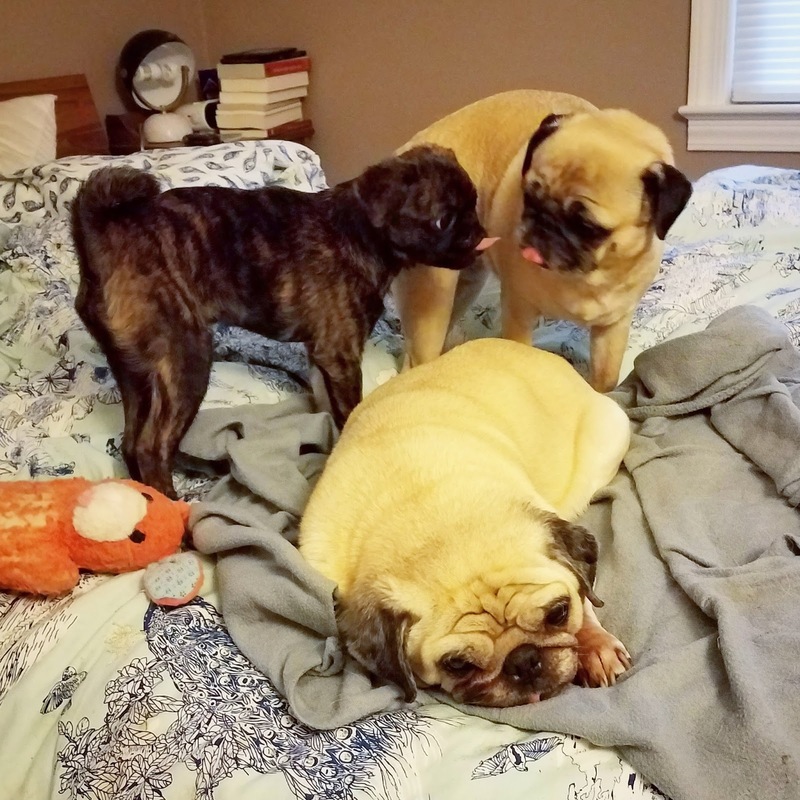 I have two girl pugs of my own, so the sibling rivalry is definitely something that I can relate to, although my girls are littermates, so we didn't have the adjustment issues like you did with Sunny. Monkey is adorable, too, and I hope she makes her way into future books that you do! Great cover!! I can't wait to change one pug into a grumble--hope Arya's okay with that :D Will pre-order it as the date gets closer (pre-orders are a great way to show publishers that a book is wanted, if anyone's wondering: ). Such a great cover!! I'm sure Sun Buns, Rosey, and Monkey are very proud of their momma. Congratulations!!!!! Can't wait to read it. So excited to see your book(s) coming to fruition! Congratulations, I can't wait to read them all! WHOO HOO! MAZEL TOV! I'm so excited for you - amazing to go from enjoying your drawings, to seeing them come to life in a BOOK! You can be sure I'll be getting this for every kiddo I know, and I'll read it to Sully and Poe, too! I'm so excited for the book! It's been such an adventure reading and seeing all your post. I just started following you on Facebook. Your Monkey reminds me of my Maxie who is almost 8 months old. I would love to read your book. Pick me ! Pick me ! Ooo Ooo please pick me ! I am so excited to see this getting a release date! The cover is so true to your gals, too. 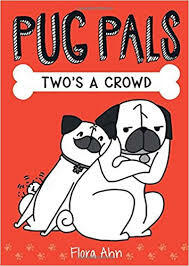 I welcomed a second pug last year and can totally relate to a lot of their antics now, and we just live vicariously through Monkey for now :) I'm always getting my cousins son pug books so we'll definitely be getting a copy one way or another! I love following Sunny & Rosy's and now Monkey's adventures, and I wish you so much success with this new book series! Your art and stories perfectly describe my 12 year pug, Pickles. I have been enjoying the tales about your grumble for years, because I can really relate. Can't wait to see this book and the next one, Three's a Grumble, that will include that cutie, Monkey. I also love getting that cute puppy fix by seeing all the Monkey posts on Facebook. Thank you. Can't wait to read all about the girls adventures and see what happens to Mr. Bunny! SO excited to see this! 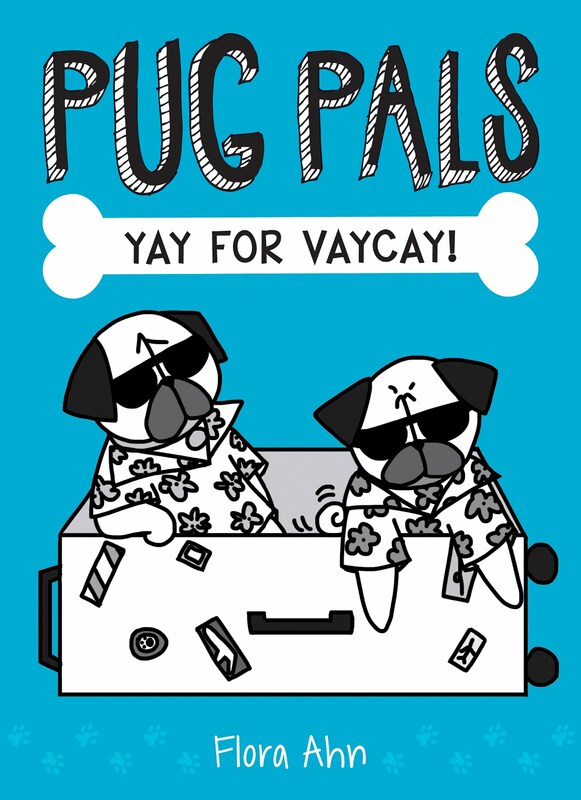 I'll definitely be buying copies for my little cousins (because I've made them pug crazy) when the book is released. If I won the galley, I'd actually mail it on to my sister who lives in Sydney. She misses my family's pug, Henry, and, in addition to sending her snaps of Henry, we always laugh about Sunny and Rosy (and now Monkey!) whenever we talk. I'd know she'd love it! Congrats again!!! Congratulations on your book! I love Monkey! Congratulations! I can't wait to read the book! Thanks for sharing your grumble with us! Congratulations, you won one of the galley editions! Please send me your mailing address at bahhumpug@gmail.com. I am so ridiculously excited for this! I cannot get enough of your girls. Congrats on the book coming together and baby Monkey- you have a big year ahead! Congratulations! I love the cover and can't wait to read the book! Ooh so excited for this book! Love your pugs, their adventures and now Monkey! I would LOVE this. So happy for you. Laura K lkubitz60609@yahoo.com. Soo soo very excited and happy for you! Can't wait for the book to hit the shelves! It's a long time coming! Congratulations! This is so exciting! We're huge Sunny and Rosy (and now Monkey!) fans! Love following you on Instagram and can't wait to read the book! PLEASE PLEASE PLEASE PICK MEEEEE!!! I also have two pugs and the younger baby is constantly terrorizing my older one with toy hoarding and drumstick attacks. :) wishing you the BEST with your book!!! so excited to read it. I would love to have a copy of this book. :D Your blog cheers up my day! I've been following you on instagram for about 2 years now and your posts bring me such joy! I would love so much to have a signed copy of your book! Congratulations!! Can't wait to read this! You and the girls always brighten my day! I love your posts, your artwork, your recipes and especially your pugs (and pug-mix). Congratulations on this book deal. I can't wait to read it. Congrats on the cover! It's adorable, as are your Pug babies. Look forward to adding the book to my collection. Ooooohhh!! We are so excited and can't wait for it to be released!! We hope you pick us! We follow you daily on facebook and love the daily antics of these puggies!! We also relate having 2 in our family. Your art is so cute and I love the cover of your new book. Can't wait to see the finished product. My son and I love to keep up with the antics of Sunny, Rosy, and Monkey! So excited you've done a kids' book! Can't wait to read this to my pugs! Congratulations on your book!! My two pugs, Zippy and Sophie, cannot wait for the book to come out!! They are are waiting anxiously to look at the pictures of their favorite cousins!! Keep up the good work. I love to follow your blog! I can't wait to read it. As pug mom to three pugs I know all about pug sibling rivalry lol! I look ve your posts and love watching Monkey join in the fun! I am so excited for your series! We have two black pug brothers (the complete opposite combo from your two (now 3))! We recently added a human baby boy to group. He is 9 months and loves his pug brothers! I can't wait to read him your stories!!! Love the posts, the photos, the shirts that you've created with your (fantastic) artwork! Congrats Flora! I can't wait to read and purchase copies to share with friends. Congratulations! Can't WAIT to buy (or win?) one!!! We love Bah Humpug and are so excited for your book!!! Congrats on your book! I love following you and your pugs on Fb. This book would be great to read to my little girl! I'm so excited for the book! I love following the pug adventures IRL. Congrats on the newest pugling. I love your pug drawings and look forward to the books. Congratulations! LOVE, LOVE, LOVE that this is finally all coming together for you. I have enjoyed seeing your illustrations and stories throughout the last couple of years or so. I am passing on my love of pugs to my grandchildren. I can't wait for your books to come out! I just love bah humpug, Sunny, Rosy and Monkey. Love your daily posts, they make my days so much better! so excited to read your books and get them for my 10 & 11 year old grandkids. Can't wait to see the finished book. I could always use more adorable pugs! Very excited for the release. I really enjoy your art and your pug drawings actually look like pugs! I'm looking forward to officially licensed stuff. I am SO excited for you!!! Being a Mommy of 2 pugs, I totally get all of the quirks and funny ways of our little fur babies. Congratulations! Can't wait for the book!!! I love reading about your little grumble! I also love tour drawings!!! I'm so excited about this book! I've been following your adventures with Sunny and Rosy for a while now, and I'm crazy about Monkey. Congratulations! I love your pug grumble! I login to FaceBook every day to look for your daily updates. Monkey is a great fit. She's giving Rosy a run for her money! This is such an exciting time! Love you guys, and really enjoy hearing about the girls' antics each day! Greatly looking forward to seeing your published work. Gives those of us struggling with the artistic dreams we buried following our 3L year some hope again. Will The Monk make an appearance in the next issue, or is she reserved for the FB family? Omg! You are no longer Nah Humpug, you have a real name!!!! I'm so excited for your book and I can't wait to buy one and share it with my little girl and our pugs! Can't wait! You are one of my favorite comic artists out there. How awesome! I can't wait until the book is out. I'd love a signed galley copy! So cool!! I will definitely mark my calendar for the publish date of your much anticipated book! Seeing Sunny, Rosy and Monkey on Facebook often brings a smile to my face, sometimes after a mundane day, I look forward to reading about their latest exploits and your clever writing describing what is going on with all three of them. Pug hugs to you, Rosy, Sunny and Monkey. Keeping my fingers crossed that I am a lucky winner of your book! Oh we would so love this!!!! I have two pugs (Phoebe and Rigby) and we love to catch up on your grumble! My late Penny Lane was going through eye surgery when Sunny had to have a procedure a few years ago and we very much appreciated Sunny's well wishes! Best of luck with your book! We can't wait to see it!! - Nance, Rigby, and Phoebe Hickman. I'd love to win a copy! I love your drawings and seeing what Rosy, Sunny and Monkey are up to! This is so great!! I'm really excited and happy for you! I was so excited to hear you were doing a book series, I would love to win a copy for my son. I am so excited and happy for you!!! I love Sunny, Rosie and Monkey. As a pug lady I love everything pug related. I can't wait. I've been counting the days until the books are released since you told us about them. I love Sunny and Rosy and now Monkey and enjoy seeing your posts on a daily basis. They really make my day. Rupert and I are so incredibly excited for you! And we are super proud of you too - we hope you are super proud of yourself! Our lives just would not be the same without the antics of Sunny, Rosy, and now Monkey in our daily routine. If whatever randomizer process you use works in our favor and we win a galley book, it will make our year. And if not, we will be ordering for sure! Oh my goodness, your book looks great! I so enjoy following you, Sunny, Rosy, and now Monkey on Facebook. My neice loves my pug Pecan and this book sounds like it'll be great in helping her deal with sibling rivarly and me to look at adorable pug drawings- hehe. Can't wait for it to be available to the public!!! So excited for you and all the furbabies! I can't wait to get hands/paws on a copy. Keep us up-to-date on the details! My fanily adores your pugs and miss your drawings! We can't wait to buy your books in January. 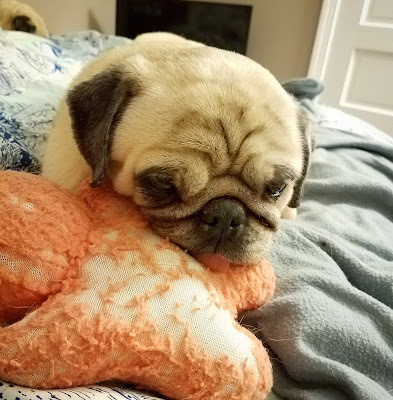 We have a rescued she-pug from Korea!! Can't wait to buy your book in January 2018!!! I can't get enough of your grumble! They are so dang cute!!!! I have one of your coffee mugs. I can't wait to add the book to my collection. I would absolutely cherish your books as I have followed your pug antics since before Rosy. I love your posts ( and book recommendations as well) and look each day for what the girls are doing. I feel like Monkey is all of our baby! I wish you all the best in your new adventure, and please know that your posts, photos and blog make this pug mom smile everyday. My mom and I would flip if we won a copy! She'd probably read it to our pug so he could enjoy it, too! I love following you, Sunny, Rosie, and Monkey. What a sweet little family you have! We are so excited for your book. My human baby loves books. We've got the Pug alphabet up in his nursery! The cover looks great and I can't wait to read the book! So excited! Congratulations! I will have to admit I love Sunny a bit more. I have enjoyed the adventures of your pugs so much! From their apartment in the sky to exploring the new yard, i have been totally enchanted. Can't wait for the book ! That's great. I'll mark my calander for sure! Ahhh! I can't wait to get your new book! It's been a long time coming, darling! Pick me pick me pick me ! Sooooo exciting!! Can't wait to see the book and would love to win this giveaway!! I'll be reading it to my 4 pug siblings! This is fantastic! Can't wait to see it! This looks amazing!! I can't wait to see their adventures! Looking forward to sharing your book with my fourth grade class! love following your puggies! We will definitely buy your book because the "tail" reminds us of the sibling rivalry between our Mowgli & Baloo, although theirs is about stealing a rawhide from each other. We look forward to reading it to our baby girl with all the pug illustrations and comparing them to her brothers. Kudos to you for learning how to design on these computer applications and staying true to your hand-drawn sketches! Preschool teacher with a pug here! My classes are always obsessed with pugs after I bring in mine and read them all the pug books I have. This would be an awesome addition! I stumbled across your blog one day on Pintrest and fell instantly in love with Sunny and Rosy. I love all their adventures. You really capture what it is like to be a Pug parent. Your page was one of the first I started following when I joined facebook. I can not wait for your books to come out. I hope that you will be adding Monkey to your drawings. Lubs you all to the moon and back. I love the cover art so much! Your blog keeps me endlessly amused, and gives me the dose of pug that I need so badly now that I no longer have one. I wish you much success with the book! Been following you for quite a while, and this is such an exciting post! A book deal and a new puppy! This is so exciting! As a pug mom and a librarian I can't wait to read this! Congratulations! I've been following you since.... well, the beginning. Your Sunny inspired me to name my beautiful pug Sunny, when she arrived. So excited to read, and hoping to be picked! I love your drawings and your captions/comments on behalf of your pugs. Congratulations on the arrival of Monkey. I hope Sunny and Rosy are adjusting well. Omigosh!! So excited!! Pug hugs. Lisa Schuler, Facebook, Dayton, Ohio. This is so exciting for you! I miss seeing them every day and am so sad I don't get to meet Monkey. I love watching the videos and always share them with Justin who misses his pugs as well. Hope you were able to find a walker who adores them as much as we did. How exciting! Can't wait to see the finished book. And to learn more of sweet Monkey! This is awesome! I love seeing your Sunny, Rosy, and now Monkey. My husband even knows about you from telling him about your pugs. I am a teacher that usually has a class full of pug lovers by the end of the year because of my love of pugs because of my pug Lucy. I can't wait for the book to come out! Great news! And congrats on a new addition! Can't wait to here the story! Can not wait to buy these books for my niece and nephew! they both love my pugs so i know they will love these! I Can't wait for it to come out!!!! I am so so thrilled for you! Can't wait to get a copy. One for me and one for my baby niece (she'll have just turned 2 when it releases). I got her Pig and Pug (illustrated by Gemma Corell) for her baby shower and I'm planning on fleshing out her Pug book collection! Congratulations! I'm so excited for you! I have a fawn senior pug, Henry and a black rescue pug, Frankie. Instead of having a grumble, I had a surprise human baby at age 40! He's nearly one and loves books and pugs and you can bet he'll be reading this series for sure! Thank,you for always making me smile and for sharing your pug antics with all of us! I'm super excited about this! I've been waiting for this post and am adding the book to my birthday wish list. How exciting to be publishing your first Pug book! And then your second! I'll be buying copies for gifts and of course myself. Anxious to hear about your new addition (I've had 3 senior black pugs). Congratulations! I've been following your instagram for a long time now and was so excited when you announced the book! I'm looking forward to its release! Oh man, we have a 6 y/o (Jeff) and will soon be adding a puppy to the mix. I think Jeff will relate to Sunny! Congrats on the grumble, on Monkey! Liam & Jack'son remind me of my fighting brothers when I was young but in Chicago last month I saw how bonded they really were in a strange place, among a throng of new people and other pugs. Your writing sounds fun, I did not know. I want a grumble too, preferably a girl because I'm outnumbered, or 'my third son'. Hopefully that will happen soon though I'm kind of over the potty training stage, my boyz are 12 and 21 months old, 'Irish twins'. I'm so happy for you! I am SO excited for this book! My pug Penny and I have followed you for years and I love how you capture the uniqueness of pugs and their behavior! I'm infinitely delighted that you got a book deal! Can't wait to see the final product. Yay!!!!!!!!!!!!!!!!!!!!!!!!!!!!!! will send an email now!!!!!!!!!!!!!!!! Love that this is happening! Excited to see the final project! Following your page is such a joy. Exciting news! I'm so excited for you! My family absolutely loves your grumble! I will definitely be buying several copies, but how awesome it would be to have a signed galley copy! So excited for your book! Going to make sure my library gets a copy! I Love Sunny, Mr Rosy ��, and monkey!!! This book looks perfect! I love your puggies! I lost mine in October and miss him every day. Thank you for your blog and emails!